Well, here's Ruby Tuesday again! With a brand new badge for the season! Take it if you want it by right-clicking and saving the image. This was the first shot I took at a pretty little house on City Island, Bronx, N.Y. The woman came out while I was shooting and said "Oh, I haven't finished decorating yet!" I don't think I needed much more than the shot above to introduce the holiday season... What do you think? I'll have more shots of City Island as the days go by so come back often to see shots of this historic seafaring community. As usual sign Mr. Linky, comment and visit your friends who also post on Ruby Tuesday. No, I'd say that one sums it up pretty well. But it's funny, when I shot that house in Wake Forest that I used for Sepia Scenes back around Halloween I got a similar reaction. I stopped along the curb and got out of the truck to get a better composition and this kid comes up and says "You should come back later when we're finished!" I had what I needed, but the kid was so earnest I said maybe I'd do just that since I'd be in town Halloween night anyway. I know the people who are doing the decorating want all of their work to be appreciated, but they don't usually understand how the photographic mind-eye works. The Big Picture is usually far less interesting than the little pictures within it. I really like the new badge, Mary! Nice badge, it does the job well. Lovely Christmas bauble! Love the quilting effect! And the new badge is simply gorgeous! Your new header is absolutely gorgeous! I am behind with my blogging, but I saw some red bushes yesterday and thought about you. My mom from Bulgaria says Hello too. Very pretty Mary and I'll finally be back tomorrow!! Your jolly red shot is very apt but I love the heading photo with it's almost colourless features and just that pale brown to show that it is in fact in colour! Lovely! thats lovely! and the new badge too! Thanks Mary for putting up RT earlier now! That's the perfect shot to start the season! You have found a very special nuance of red for the season. Kind of old modish with gold. Besutiful! Same style as the shoes for Christmas. Make me want to dance. Hi Mary - hope all is well and that Turkey Day was fabulous. Love the bridge and the dramatic backdrop on your header - very effective! sorry about leaving 3 same links, I'm having trouble at mr. Linky. Holiday time is almost here ~ I hate to rush the season, so I haven't started to decorate yet. But I will. Nice photo of the ornament, and I love the new badge. I just used it for my post today. And I already told you I like the new header - it's a pretty scene. Red is perfect for this season. Whether the decorations were complete or not, you did capture the essence of the time, Nice! It looks like a giant red ball! It is a great capture and very festive looking. BTW, I lvoe your header photo it is gorgeous. that is so pretty! love the shot! mine's up too:) The badge is cute. Gorgeous, Mary. That is really lovely. You have introduced the season of "red" very very well! And, I love the new badge! It's shiny and bright! That's a gorgeous Christmas decoration. I love the contrast to the blue sky. Beautiful shot, Mary - simple and sweet! Oh, and yeah, your header is making me swoon! I like the shoes, it's a ncie badge... I'm joining in, thanks. Your blog looks great! Love the angle of your RT photo!! What a great ornament I cannot wait to see what you post in the coming weeks Mary! I love this new badge Mary. Love the quilted effect, and love the season. I received my pillow today. Thank you very much. I'm displaying it on my couch. Can't find Mr. Linky either. I'll check back later. hi mary t..i can't find mr. linky but that's ok.
at least i found your comment section and i can see all your friends so far..40 of them already. and at least i could see that beautuful picture at the head of your blog and the perfect christmas red photo! Love the new badge! Too cute for words! Happy Ruby Tuesday everyone! I like the new badge and your new header. The red Christmas ball is indeed making me feel the holidays! What a great ornament! Your new header is beautiful. Love the new badge! Great photo for Ruby Tuesday. I've been thinking of photographing my favorite ornaments on our tree this year! Very nice badge and photo. There is no Mr. Linky or McLincky. any problems ? Oh Mary, your new header photo is GREAT! Wish I had a scene like that to shoot. A fine job. 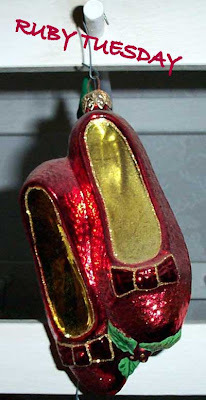 And I totally envy the adorable ruby slipper ornament. I want one. I agree with Mojo that it's frequently in the "up close and personal" when it comes to effective photos. That's a cheery, perfect ornament for such a lovely Xmas photo. I've done some brilliant autumn leaves, come visit if you have time. That's a fun shot. Yep. I'm starting to see holiday decorations around here too. Love your header shot and the badge. Great shot for the first day of December. Great picture of the decoration. I also love the new badge and you new header picture! That's a great photo to start off the festive season. Your header is quite amazing too. That's pretty...it looks very large!! Is it? Or just a macro shot? Beautiful Ruby pic to welcome the Christmas Season ! Wow you are ready for Christmas. Happy Ruby Tuesday. There is no denying the holiday season now that you have posted this. A BEAUTIFUL holiday shot...and I LOVE your winter header! WOW! 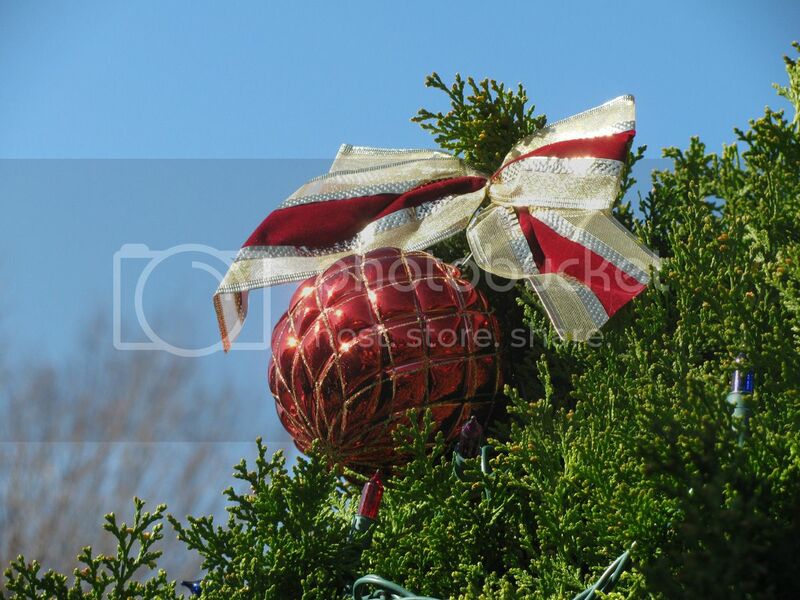 Mary, I love your header and your Christmas ball, it has beautiful color and texture. I concur with your commenters, its the little things that count in the photograph as much as the big picture. Wow, I bet its looking like Christmas in your neck of the woods. Happy RT! Beautiful decorations and so cute red badge for season !!! Happy Christmas waiting to you. Great color contrast... I love the blue, green and red. It is so pretty and the clarity is gorgeous. With all the Christmas, I am SO getting into the spirit. I'm hoping we make a difference today, World AIDS Day, the perfect day to go (RED). Miss you visits. Love this red Bulb. Was it really big. I hope we will see the tree all deck out. Love the new Ruby Red Slippers for today and the Red Christmas ball - perfect!! What exactly is Ruby Tuesday??? Oh yes!! That's perfect to lead us into the season! I have a pretty scene up too! What an exquisite photo! I like the angle, the tones and contrasts and the feeling of holiday spirit. It is so beautifully captured. I love your header shot, Mary. :) Looking at the picture with the evergreen and the red bulb, I was instantly reminded of what those bushes smell like. I wish you a wonderful day! Very pretty. I am so excited about the holidays. it's freezing cold here lol! i like the header. That's lovely! But I absolutely *love* the new snowy photo on the top of your blog! Brrr.